Tiny houses come in numerous designs. Picking a design that’s right for you is very important. Living in a small space means that area should to be designed to fit your needs. Who is Going To Live in the Tiny Home? When thinking of your tiny house design it is important to think about who is going to live there. Will it be a single person, couple or a family? What about pets and children? Each person or animal will have significant needs in the design of the tiny house. Each person (or animal) needs to have a space they can call their own. That may be a cupboard niche for the cat, a storage space for your sons toys, or a loft area where you can practice your guitar. If you can, walk through examples of tiny houses. You can connect with builders and tiny house owners in your area. When you look at each example think about how the features would be important or not necessary to your situation. Take the time to explore online options. Many design companies offer floor plans and pictures you can browse. Make notes on what you like and what you don’t find necessary. Do you want to remain in one place or do you want to travel? 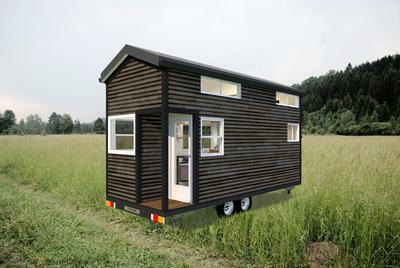 One of the biggest decisions when building a tiny house is to decide if you will be mobile or stationary. A tiny home gives you many options. You can travel and see the country, especially if your job is remote or freelance based. Or you may choose to park in one of the many community tiny home parks cropping up around the world. 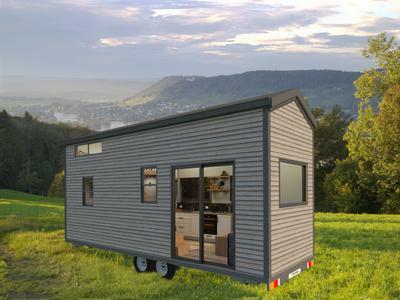 A mobile tiny home needs to be built on a trailer so that it can be pulled. A mobile design does need to conform to some size restrictions to conform with motor vehicle laws. If you own land or are parking a tiny house on the back of your property then you can put it on a foundation. A stationary design also gives you more choices in size and materials. You can also add a deck or greenhouse to expand your outdoor living options. Many people put tiny homes on their property to serve as a guest house or a grandparent home. A loft gives additional space as well as storage room. To add a loft means to add stairs or a modified ladder. Under the stairs is a great place to add storage options. However, if you are older, have a health issue such as arthritis or have a rambunctious toddler you may decide that a single story is best. In a tiny house you want structures and furniture to have multiple functions. This saves on space and makes each thing more usable. For example a window seat may also function as a trunk to store bedding. Some designs put the toilet inside the shower. This saves space on the overall bathroom footprint. Use vertical space to increase your living area and storage room. Shelves and cupboards can go up walls. Higher storage can be used for those necessary things that you don’t use on a daily basis such as tools. Think of where you can place kitchen utensils and appliances so that they do not clutter the counter and work space. Hanging utensils such as spatulas, mixing spoons and bowls keeps them accessible but out of the way. Are there certain things you can’t live without? For example, do you want a dishwasher, bookshelves or a fireplace? Each of these things takes up considerable space so a decision on comfort and need must be decided upon. Consider your options and experiment. For example, spend a week doing dishes by hand. Is that something you are comfortable with or do you want the convenience of a dishwasher? Are you looking for great plans to build your own tiny house? Check out Tiny House Plans. These plans are suitable for Australia, New Zealand, the United Kingdom, the United States, Canada and many more countries. Each design includes several different plans such as elevation, electrical and framing and are engineer approved. 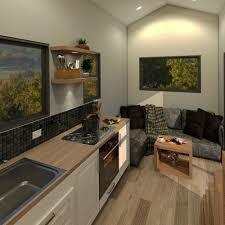 The Freedom by Tiny Home Plans offers ample room for a small family or a couple with pets. The 7.2 metres x 2.4 metre (24 x 8 feet) lovely open floor plan makes it feel large. Lots of windows make this home feel light and spacious. The Freedom features all the comforts of home with a full bath and kitchen. The Minimalist is a compact design perfect for a single person or couple. At only 6 metres x 2.4 metre (20 x 8 feet) and 3,700kg or 8,157 lbs this is a great travel option. The Minimalist packs a lot into a small floor plan with a king sized loft, full kitchen and washing machine. Whatever you chose, take the time and think it out. You will enjoy your tiny home so much more when it reflects your needs and desires.